One of the benefits of the new management standards is that it provides a risk-based approach, this enables the company to look inwards and outwards to realise its strengths and weaknesses and give a positive vision to its future growth. 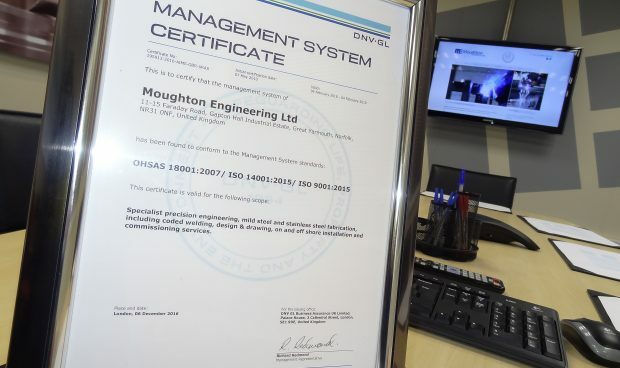 These new management systems will also enhance the services that Moughton Engineering can provide to its existing and future customers together with improvements to leadership engagement and supply chain management, the accreditation demonstrates our ongoing commitment to high quality service, mitigating business risk and commitment to leadership, giving confidence that Moughton Engineering is always seeking to keep up to date and improve at every opportunity. Stay up to date with Moughton Engineering’s news and recruitment by following us on LinkedIn: Moughton Engineering Ltd.